Hi, when I am typing something, lets say in size 36, The Cursor size stays the same, Even HERE Until I press Enter. This refers to typing posts in this forum, not in Evernote, correct? FWIW, it's not happening to me. Maybe browser dependent? This forum and Evernote, maybe it is the browser. The first pic that says "see the big cursor???" is from Evernote. No, it's from the forum editor, not from an Evernote application. Yep, well spotted. I don't see this problem in Chrome on Windows, for what that's worth. 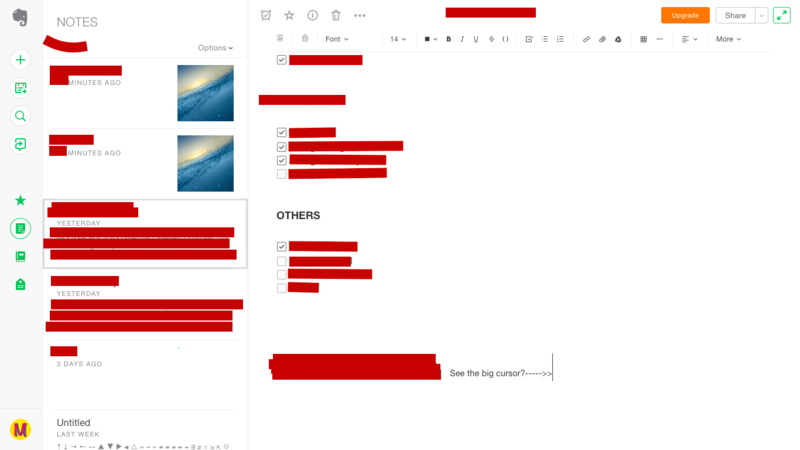 The Evernote web toolbar that you show in your own screen shot does not match the screen shot in the original post. It does match the forum editor. They are not the same editing toolbars. The first screen is actually from the Evernote forum software here, and has nothing at all to do with the Evernote web application. I have no idea why you posted a screen cap from the web application. What was the point of that? You're just confusing things. Oh, your mixed up, I did send a pic of this. Sorry if I got you mixed up.